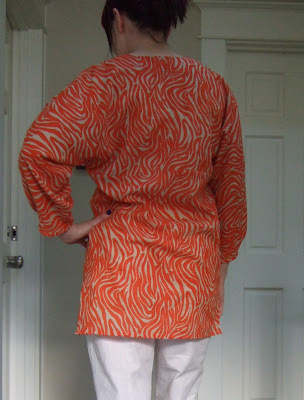 This is an easy tunic, I lengthened it several inches because it's going to do double duty for me as a swim cover-up as well when I'm on vacation later this month and trying to pack light. Soft cotton voile that I got at Michael Levine in LA this spring for the insanely cheap price of $3/yard. I mentioned that I added a few inches to the length, and that's it as far as alterations. I finished all the seams as French seams because cotton voile deserves nothing less. Here's a close-up of the pleats at the sleeve hems. It's exactly what I was needing, and it was simple to make. My muslin for the Burdastyle swimsuit turned out okay, so I placed an order at Spandex House early last week. They called me the next day at 6:45 am to ask for my credit card info. (There's a 3 hour time difference.) I had a feeling they would do that... Thank goodness it was a weekday so I was already awake. I haven't made anything from May or July yet so you are still way ahead of me. 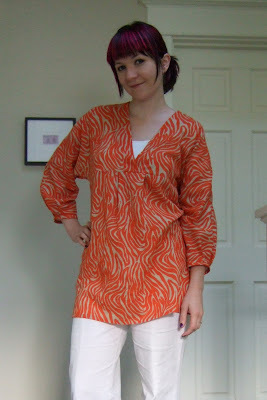 The tunic looks great on you and it's a good idea to double as a swimsuit cover up. A gorgeous top that looks great on you. Love the new hair as well! I LOVE it! You got the fabric and the color right too! Fabulous job! I love it!!! I LOVE that fabric! It looks great! I love the orange fabric! Talk about a top I wouldn't have looked at twice. That's the perfect fabric and I love the pleats on the sleeve. I must learn to master the french seam too. I also LOVE the hair. That's a very cute tunic/bathing suit cover up. Love the orange print and the price. I just love to get a bargain, too! Very cool and cute! I love that print. That fabric is TDF! Love this as a top, but as a cover-up too! Genius. Super cute fabric in the perfect pattern. Love your hair too. 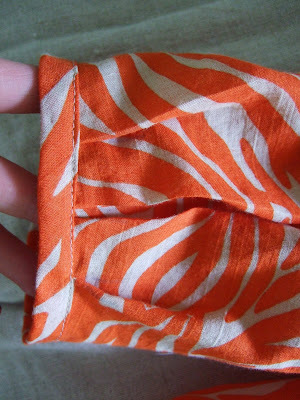 The fabric reminds me of the orange/white shirt I made earlier this summer. Good idea to lengthen it...it looks great! Gorgeous! I especially love the fabric. Beautiful top and I love it's versatility! Tunic look great. As does your hair! The fabric is delicious and is a great match to the design! This looks great! 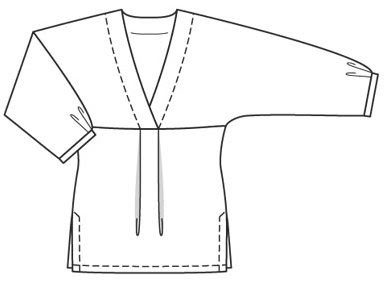 I just traced this pattern myself and was wondering what it would look like made up. All of your things are so lovely. Christina I love the new hair color on you, wow! And what a great use for that fabric, it came out perfect. really cute. i love the orange and fall sewing too! Love the voile! It turned out really cute! Lovely blog! Will check back often! gorgeous tunic. In BWOF, the pattern for me was very unimposing. With your style and the color of the fabric it becomes an eyecatcher. Congratulations! Love the top. And those shades of orange-red look great on you. Love your new hair too.